Kiri's having a party? And it's already started? I'm so out of the loop! Of course I want to go. It's just that. . .um. . . well. . .
Hey Smudge! Can you please bring me that ladder? Special Additions! Click here to see the Wild Party Crasher! Click here to see the lovely but shy Miss Domino, our Farmgirl Fare Foster Blog Cat. Attention Cat Lovers! 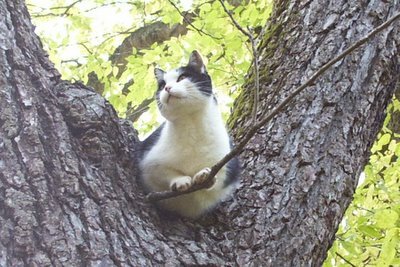 It's time for Weekend Cat Blogging #21: Kiri's Birthday Celebration! Yep, that wild and crazy cat from Down Under is turning one, and Clare is having a party. Just click here to head over to Eat Stuff, where you'll find all the links to this week's party cats. We'd love to have you join us for Weekend Cat Blogging. Just send your permalink in a comment to Clare (Kiri's slave) at Eat Stuff and add a "Weekend Cat Blogging" tag to your post. So cute... So did smudge come through? Hey hey! Someone should help Patchy Cat down!! and do HURRY! Caramel over at Heather's Space! doesn't want him to miss that party! She hopes the party crashing doesn't happen either! Yikes! Hope to see everyone over at Kiri's party! soon! Hurry uo there is still plenty of fish and prawns left! 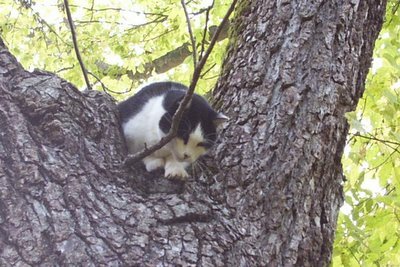 Patchy Cat, what were you doing up the tree? Let me guess, you wanted to catch a nice fat birdie for Kiri's birthday pressie? 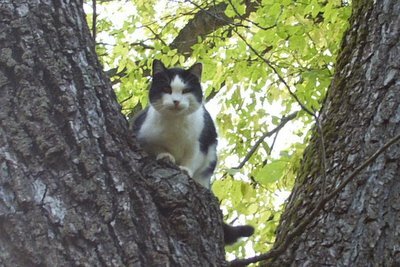 I hope Smudge brought the ladder or else it will be a long nite up that tree. I think the party lasts all weekend. You know how cats are. Oh, I was just getting a better view of my farm from up here. So much to see and supervise! No, Cat + Road = Not Good.